The assessment and management of acute limb ischemia begins with a thorough history and physical exam. The most important aspects include timing of symptom onset and the “5 Ps” (pain, pallor, pulselessness, paresthesias, and paralysis). Once the diagnosis has been suspected, Doppler ultrasound should be performed, and intravenous heparin-based anticoagulation initiated as soon as possible. Class I – Patients without weakness or sensory loss, and with flow detected on both arterial and venous Doppler. These indicate a viable limb which is not immediately threatened. Class IIa (marginally threatened limb) patients will have mild sensory loss and mild-moderately decreased arterial Doppler findings (see figures 1 and 2). Class IIb – Significant sensory loss with mild-moderate muscle weakness and decreased/absent arterial Doppler. This stage indicates an immediately threatened limb. Class III – The absence of venous flow is ominous finding, identifying a Class III limb (irreversible damage); profound sensory loss and muscle weakness will be noted at this stage. Class I patients may treated electively, although for some patients earlier angiography may be appropriate. Class I and IIa – Once angiography is performed, the findings will direct whether catheter directed thrombolysis or surgical embolectomy is the better course of action. If catheter based thrombolysis is performed, follow-up angiography can then demonstrate the presence and extent of any underlying lesion. The patient may then be treated with anticoagulation, percutaneous intervention, or surgical bypass. 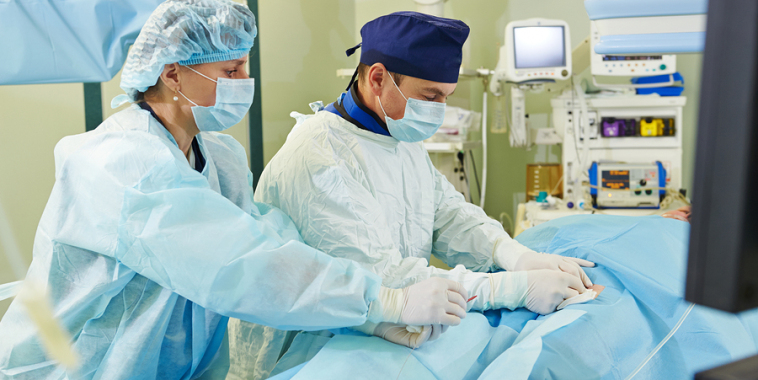 Class IIb patients usually will require surgical embolectomy due to the time-sensitive nature of their condition. After embolectomy, as in IIa patients, angiography will determine the pathway depending on the results. Amputation is frequently required for patients presenting with Class III findings, depending on the duration of the symptoms. For those patients presenting relatively early, surgical embolectomy may be attempted, while a late presentation will likely necessitate an amputation. Fasciotomy should also be considered early in these patients course. In cases of arterial or bypass graft thrombosis, there is frequently an underlying atherosclerotic obstruction which will require intervention in addition to a thrombectomy. Acute thrombus responds well to mechanical thrombectomy and thrombolysis. Sub-acute thrombus does not typically respond as well to mechanical thrombectomy and thrombolysis alone, and sometimes the addition of laser atherectomy can lead to improved results. Patients with distal embolism can be successfully managed with thrombolysis or embolectomy. Finally, limb ischemia from trauma is best managed with embolectomy and surgery. A thorough but rapid assessment of the patient and a team-based systematic approach will lead to optimal outcomes for patients presenting with acute limb ischemia. References: Rutherford RB. Semin Vasc Surg 2009; 22: 5-9.